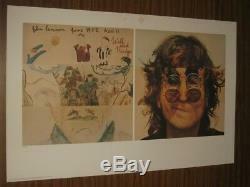 THE BEATLES - YOKO ONO SIGNED "JOHN LENNON - WALLS AND BRIDGES LITHOGRAPH". THIS PARTICULAR LITHOGRAPH HAS SOME MARKS LOCATED IN THE WHITE FRAMING AREA AS SHOWN IN THE PHOTOS, THERE IS ALSO ONE VERY MINOR CREASE ON THE TOP RIGHT HAND CORNER. BOTH THE MARKS AND CREASE SHOULD BE COMPLETELY COVERED ONCE FRAMED. If your a BEATLES FAN, you will fall in love with this extremely rare lithograph. It is an Original Museum Edition Lithograph which is very hard to find anymore. Is yet another classic lithograph to add to that already growing Beatles collection, capturing John Lennon at his best in these stunning shots. This particular lithograph is numbered 213 out of 350, be sure to be quick on this one as it is not going to last. This Lithograph was produced on the finest quality paper stock, it is part of the one and only edition of BEATLES album art Lithographs, it is an AUTHORIZED APPLE CORPS PRODUCT. This item is in great condition besides the marks mentioned above as shown in the photos, you will not be disappointed with this amazing piece of art. It really is a quality item and the chance's of obtaining this item is very rare. These limited edition lithographs do nothing but rise in value over time as for they are very collectible and very sort after. This item will also come with a certificate to guarantee the item is authentic as well as a photo of YOKO ONO signing the lithograph. Be sure to check out many other BEATLES lithographs on our auctions. Some of the last remaining lithographs we have in stock are: ABBEY ROAD, SGT PEPPERS, WITH THE BEATLES, PLEASE PLEASE ME, MAGICAL MYSTERY TOUR, JOHN LENNON - IMAGINE, LET IT BE, HELP, RUBBER SOUL, and THE WHITE ALBUM just to mention a few, there are many other HAND SIGNED photos, drumhead's, posters, lithographs, cds, and much more, be sure to have a look or your going to miss out. Some of the bands available are. GERARD WAY, JAMES HETFIELD, FRANK IERO, MIKEY WAY, MAYNARD, TOM DELONGE, ANTHONY KIEDIS, THE BLACK KEYS, JOSH KLINGHOFFER, RAMMSTEIN, FLEA, RADIOHEAD, TILL LINDEMANN, THOM YORKE, JACK JOHNSON, PARAMORE, ROB ZOMBIE, EMINEM, ROB THOMAS, B. KING, MIKE PATTON, ALICE IN CHAINS, METALLICA, PINK - ALECIA MOORE, SICK PUPPIES, GREEN DAY, NINE INCH NAILS, NIKKI SIXX, MICK MARS, BOB MARLEY, MIKE McCREADY, THE WHO, AC/DC - BLACK ICE, AXL ROSE, BRUCE SPRINGSTEEN, EAGLES, ROGER WATERS, SLASH, EDDIE VEDDER, ROBERT SMITH, FRANK ZAPPA, RAGE AGAINST THE MACHINE, RED HOT CHILI PEPPERS, DAVID BOWIE, PEARL JAM, ALICE COOPER, TOOL, JON BON JOVI, IRON MAIDEN, THE ROLLING STONES, BOB DYLAN, THE POLICE, FALL OUT BOY, NIRVANA, BLINK 182, JOHN LENNON, MY CHEMICAL ROMANCE, DISTURBED, LED ZEPPELIN as well as many more. Large framed items will take 2 to 3 days to be posted due to the extra packing that is required. Our # 1 priority at Native_Dazza_Direct, is having you 100% satisfied, about our products and fully delighted with our service. Our feedback defines our commitment and dedication to providing you with the highest quality of professional customer service. For international enquires, please be aware of the time difference. Some enquires may take several hours to be answered, if your message is received outside of our scheduled business viewing hours. Auctiva Offers Free Image Hosting and Editing. The item "THE BEATLES YOKO ONO SIGNED JOHN LENNON WALLS AND BRIDGES LITHOGRAPH" is in sale since Sunday, January 14, 2018. This item is in the category "Music\Memorabilia". The seller is "native_dazza_direct" and is located in Milton, NSW. This item can be shipped worldwide.